In the Book Notes series, authors create and discuss a music playlist that is in some way relevant to their recently published books. 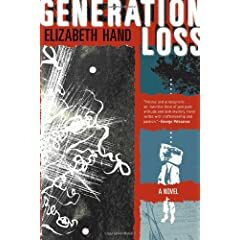 With Generation Loss, Elizabeth Hand has created a work of literary crime fiction that truly impresses the reader with its suspenseful storytelling. I meticulously, obsessively soundtrack everything I write — every heartbeat, every footstep -- so this is a very winnowed-down list. GL is all about the rage, so I dug into the vault for some of my old punk vinyl. I’ve arranged the songs to suit the novel’s central characters. Led Zeppelin,"Immigrant Song": When I was 12, my younger brother gave me this 45 as a Christmas present. Etched into the vinyl alongside the label were the words DO WHAT THOU WILT SHALL BE THE WHOLE OF THE LAW. I thought that was really cool. The Adverts, "One Chord Wonders"
Siouxsie and the Banshees, "Helter Skelter": Best Beatles cover ever. The Heartbreakers, "Born to Lose"
The Mekons, "Hard to be Human Again"
Sonic Youth, “Tunic (Song for Karen)”: I used to hate the Carpenters, but this always makes me cry. The Strokes, "The Modern Age"
PJ Harvey, "Down by the Water"
Richard Thompson, "Season of the Witch": Thompson is getting something out of his system with this one. Truly demonic, hair-raising guitar solo. The Gun Club, "For the Love of Ivy": Or maybe Thompson was listening to this. I really don’t want to know what Jeffrey Lee Pierce is doing at the end of this song. Suicide, "Rocket USA": Another creepy one. Could have been the soundtrack for the original film Carnival of Souls. Black Rebel Motorcycle Club, "Restless Sinner"
Harry Nilsson, "Jump into the Fire": Another sick song, with a great Gene Krupa-style drum solo from Jim Gordon, of Derek and the Dominos. The Replacements, "Rock and Roll Ghost": The ‘Mats elegy for Johnny Thunders. Fade to black. Neil Young & Crazy Horse, "Pocahontas": If Generation Loss had a theme song, this would be it — the live version from Year of the Horse. I think this should be the National Anthem.